Decorating streets and events, customizing fabrics used for upholstery and apparel, Mimaki's dye sublimation technology meets various customers' needs with suitable printers. Mimaki's state-of-the-art technology expands your horizon by adding a wider range of capabilities for your clients and open up a new era of soft signage. Feature1 No need to make screens, Digital printing. Cost-reduction and quick turn-around times are realized for small production runs. Digital printing enables on demand printing which allows for quick response even for a single sheet order. Feature2 Full-color printing enhances your designs. When using full-color digital printing, you don't need to worry about screen costs since it requires no screens. 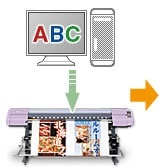 Digital full-color printing produces photographic image quality without halftone dots. Neither screens, nor chemicals such as emulsion are needed. 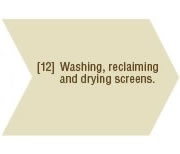 Moreover, production facilities and equipment for screen making process and waste treatment are not required. The images are initially printed on coated transfer paper as a reverse image of the final design, which is then transferred onto polyester fabrics in a heat press operation. Under high temperature and pressure, the dye turns into a gas and permeates the fabric and then solidifies into its fibers, The fabric is permanently dyed so it can be washed without damaging the quality of image. Reversed image is printed on transfer paper and dried The transfer paper and media to be printed are put into a heat press, then the image is transferred onto the media. What is sublimation transfer print? Printed surface of the transfer paper is placed on the polyester fabric and the two are pressed together at high temperature. 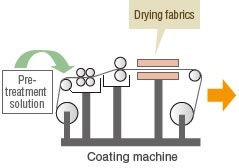 The molecular chains of the fibers break on heating, and the sublimated ink molecules are caught between the fiber molecules and fixed on the fabric. The images are directly printed on treated polyester fabrics, which are then heated by heat-fixation devise that fixes the color on the fabrics. 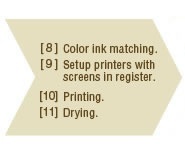 This method eliminates the need for transfer papers. This means no paper cockling and reduction in defects such as ghosting and various wave or tiger stripes that are common in roll-to-roll transfer printing. This type needs a ink waste pit to collect excess ink and prevents it from staining the reverse side of the fabric. *Pre-treated fabrics are on the market. Please contact our dealers for details. What is Direct sublimation print? 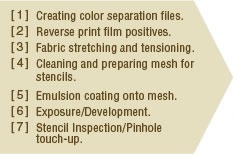 Direct printing on pretreated polyester fabric without using transfer paper. After direct printing, the polyester is heated for color production and fixation. Direct sublimation printing is transfer paperless environmentally friendly method, and provide high level print results with sharper image than transfer printing.